A cluster, or conservation, development concentrates development in the least ecologically sensitive area of a parcel, and protects the remainder as natural open space. Photo Credit: State of Massachussetts (mass.gov). Cluster, or conservation, development regulations are implemented through the municipal zoning ordinance and subdivision and land development processes. This can be accomplished by allowing this development as a permitted use; encouraging it through density incentives that allow a certain additional percentage of units on the land; requiring cluster subdivisions for larger parcels in specified zoning districts; or making it a condition of rezoning. Some communities offer density bonuses for developers in exchange for incorporation of certain water conservation features. Cluster/conservation development encourages more growth on less land, means less land must be devoted to roads, maximizes open space, and minimizes impervious surfaces per capita – resulting in less water runoff. Well-planned conservation development preserves natural drainage systems that help control stormwater runoff and soil erosion by concentrating development on the most buildable portions of the site. Benefits of cluster/conservation development to developers include reduction in site development costs and increase in the market price of individual plots as compared with traditional subdivisions. Construction costs are less because of the reduced length of streets and utility installations, which means maintenance cost savings in the long run. Cluster development is also a mechanism to retain the rural character of developing communities by concentrating development and preserving farmland and other valuable open space. Water and land use information from Denver Water shows that medium and high density development uses 10% to 20% less water than low density development with the same population. Denser development is essentially water conservation development because there is less area capable of being landscaped, resulting in reduction in outdoor water use compared to housing on larger lots. Outdoor recreation areas, such as playgrounds and swimming pools, can be located in a central location for community use, enhancing a sense of community, and providing opportunity for social interaction. 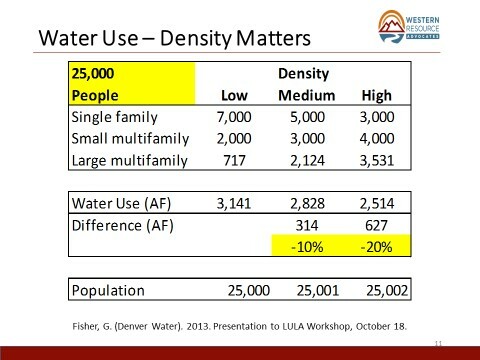 Water and land use information from Denver Water shows that medium and high density development uses 10% to 20% less water than low density development with the same population. The term “cluster development” may have a negative connotation for some developers and planners, who may envision it as overly dense and lacking quality of life amenities. This may require outreach and education to better understand and promote cluster/conservation development. The Town of Sahuarita, a community of 27,000 people located south of Tucson, allows cluster development as an option for all rural and residential zones in order to protect natural habitat and allow more flexible and cost-effective development. The code identifies several permitted uses, which include “cluster open space” and functional open space (playgrounds, trails, etc.) in addition to subdivided lots. It sets limits on the percentage of man-made impervious surface associated with functional open space. The development standards are relatively general, setting a minimum allowable lot size of 2,000 square feet and allowing for both common-walled and detached units, though there are limits on the number of common-walled units in the cluster groupings. Open space must comprise at least 30% of the site area. Development review procedures involve a cluster plat approval process that requires a pre-application meeting with a review committee and planning staff, and a developer-hosted public meeting designed to allow the developer to receive input on the proposed development from nearby property owners. The code also includes an extensive section on creation, responsibility, and structure of homeowners associations (HOA), which are required to be formed in association with maintenance and responsibility of any common areas, including the cluster open space. These sets of covenants run with the land, provide for creation of the HOA, and must include a clause stating that the Town is not responsible for maintenance or liability of the common areas. 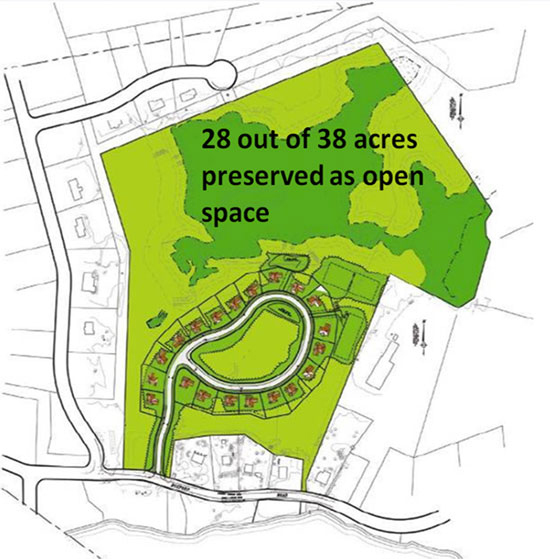 However, the code specifies that the common open space cannot be disturbed in any manner (unless previously approved), without the approval of the Town council. EPA’s Protecting Water Resources with Higher-Density Development repot can be found here.